Be the first to share your favorite memory, photo or story of Verna . This memorial page is dedicated for family, friends and future generations to celebrate the life of their loved one. Verna B. Nabity, 93, passed away peacefully at home surrounded by family on March 4. Rosary will be 10:30 AM Friday, March 22, 2019 at Livingston-Sondermann Funeral Home Chapel in Grand Island, NE. Visitation will be 5-7 PM Thursday, March 21, 2019 at Livingston-Sondermann Funeral Home Chapel. Burial will be at Westlawn Memorial Park Cemetery following the Rosary. She was born November 10, 1925 in Elba, Nebraska to James and Lizzie (Duester) Szwanek. The family moved to Cotesfield in 1930 where she attended school from kindergarten through graduation. Verna was employed at the Farmers Elevator in Cotesfield and St. Paul Cleaners until her marriage to Leo P. Nabity on June 4, 1946. They lived near St. Libory, Cotesfield and Grand Island. They had three sons: Leo James, Dan and Ron. The family moved to Sacramento, CA in 1965. Her husband died in 1967, after which Verna worked at the Montgomery Ward garden shop and the State of California as an Accounting Technician. She retired in 1988 after 13 years of state service. She was a member of the St. Charles Borromeo Parish and California State Employees Association. 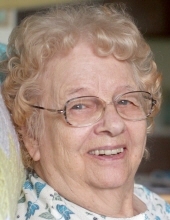 Verna lived a full life and enjoyed many pursuits, including gardening, quilting, baking, wood-working, grandparenting and great-grandparenting, and traveling to Nebraska to visit relatives and long-time friends. Verna was cheerful, optimistic and she greeted everyone she met with a smile. She is survived by sons, Dan (Carla) Nabity of Orangevale and Ron (Lisa) Nabity of Roseville; grandchildren, Monica Nabity, Jason (Jenny) Perrazo, Mathew (Christy) Nabity, Kenneth (Clara) Nabity and Jeffrey (Stephanie) Nabity; great-grandchildren, Hannah, Jacob, Evan, Lilly, Phoenix, Jayce, Colin and Anna. She is also survived by brothers, Frank (Mildred) Szwanek of Mullen, NE and Ed Szwanek of Evanston, WY; sisters, Katherine Kyhn and Sylvia Chelewski, both of Grand Island, NE and Rose Marie “Rosie” (Paul) Kielian of Omaha, NE; and more than 50 nieces and nephews. She was preceded in death by her parents; her husband; son, Leo James; brother, Adrian; sister-in-law, Pam; and brothers-in-law, Ron Chelewski and Monty Kyhn. In lieu of flowers, please spend time with your loved ones, plant flowers in your garden, or bake a cake for a friend. Memorials are suggested to the family to be designated at a later date. Online condolences may be directed to www.livson.com. Livingston-Sondermann Funeral Home is entrusted with arrangements. To send flowers or a remembrance gift to the family of Verna B. Nabity, please visit our Tribute Store. "Email Address" would like to share the life celebration of Verna B. Nabity. Click on the "link" to go to share a favorite memory or leave a condolence message for the family.